Questions abound about these unconventional couplings. Three years ago, William Mamel climbed a ladder in Margaret Sheroff’s apartment and fixed a malfunctioning ceiling fan. “I love that you did this,” Sheroff exclaimed as he clambered back down. Spontaneously, Mamel drew Sheroff to him and gave her a kiss. “I kind of surprised her. But she was open to it,” he remembered. Since then, Mamel, 87, and Sheroff, 74, have become a deeply committed couple. “Most nights, I’ll have dinner with Marg and many nights I stay with her overnight,” Mamel explained. And yet, despite the romance, these North Carolina seniors live in separate houses and don’t plan to move in together or marry. Demographers call this type of relationship “living apart together” (LAT). 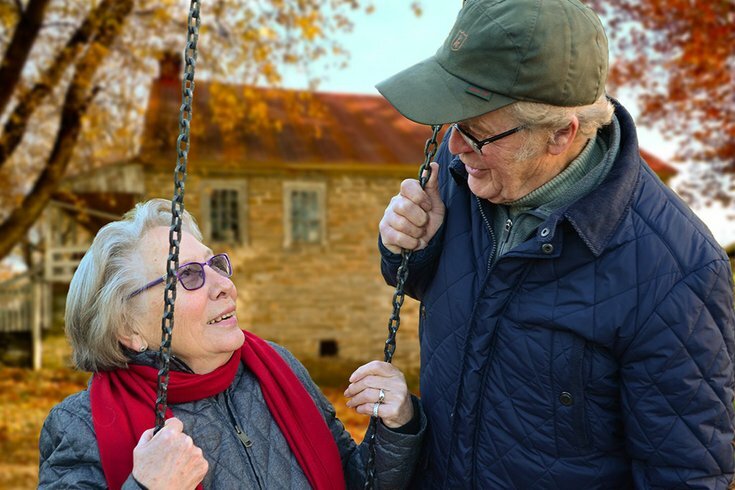 “It’s a new, emerging form of family, especially among older adults, that’s on the rise,” said Laura Funk, an associate professor of sociology at the University of Manitoba in Canada who’s written about living apart together. Questions abound about these unconventional couplings. What effects will they have on older adults’ health and well-being? Will children from previous marriages accept them? What will happen if one partner becomes seriously ill and needs caregiving? Researchers are beginning to focus on these concerns, said Susan Brown, chair of the sociology department and co-director of the National Center for Family and Marriage Research at Bowling Green State University in Ohio. “It’s really remarkable that older adults are in the vanguard of family change,” she said. Last month, at the annual meeting of the Population Association of America in Denver, Huijing Wu, a graduate student in sociology at Bowling Green State University, presented an analysis of nearly 7,700 Wisconsin adults age 50 and older surveyed in 2011. Married couples accounted for 71.5 percent of that group, single people accounted for 20.5 percent, and people who were “partnered but unmarried” accounted for 8 percent. Of the partnered group, 39 percent were in LAT relationships, according to a more focused definition of this arrangement, compared with 31 percent who were dating (a less committed, shorter-term relationship) and 30 percent who were cohabiting. Jacquelyn Benson, an assistant professor of human development and family science at the University of Missouri, is among a handful of researchers who’ve asked older adults about their experiences in LAT relationships. “Older adults really see this as a lifestyle choice, not a relationship of convenience,” she said. Benson’s 2016 study of 25 older adults (from 60 to 88 years old) in LAT relationships found various motivations for these partnerships. Seniors wanted to have “intimate companionship” while maintaining their own homes, social circles, customary activities and finances, she discovered. Those who’d been divorced or in unhappy earlier marriages didn’t want to tie themselves down again and believed a degree of distance was preferable to day-to-day togetherness. Also, several women who’d cared previously for sick parents or husbands wanted to avoid assuming caregiving responsibilities or the burden of running a household again. Caregiving is a thorny issue, on multiple fronts. The only known study to look at caregiving in LAT relationships, out of the Netherlands, found that about half of partners planned to provide care, if needed — a sign of ambivalence. But when illness entered the picture, partners offered assistance nonetheless. “People in LAT relationships forget there’s going to be this emotional entanglement and they won’t just be able to walk away,” Benson said. Other complications can arise if adult children resent or fail to recognize their older parent’s outside-of-marriage relationship. “In some cases, when a partner wants to step in and have a say, they’ve been pushed out by family members,” Benson noted. Only a few studies have evaluated the quality of LAT relationships, which has implications for seniors’ well-being. One found that older adults in these relationships tend to be less happy and receive less support from partners than people who are married. Another, presented at last year’s Population Association of America meeting, found that the quality of LAT relationships isn’t as strong as it is for marriages. That hasn’t been true for Luci Dannar, 90, who’s been involved with James Pastoret, 94, for almost seven years, after meeting him at a dance at a Columbia, Mo., senior center. William Mamel is already making good on a similar promise to Margaret Sheroff, who had a mass removed from her gall bladder late last year and recently was hospitalized with complications from chemotherapy.